SecuriWORLD is Greater Vancouver`s leading Security firm, providing a full range of Security Services. We are fully licensed and insured so as to serve you safely and responsibly. The superior quality of our Security Guards, Mobile Security, Alarm Response, and other Specialized Security Solutions has earned us our place on top of the security industry. Our clients value efficiency and economy so we customize our Security Services and prices to meet your needs. Our highly-trained Security Specialists are ready to provide you with a Free Security Consultation in person. 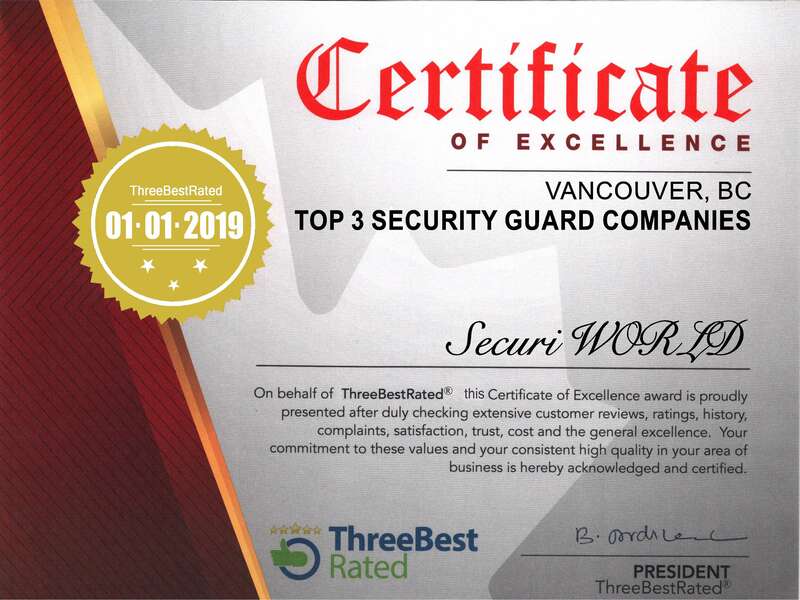 SecuriWORLD have raised the bar for quality security guards standards in the Vancouver security industry by providing multi-tier support from an engaged management team. With an account manager and field supervisor, SecuriWORLD Security mitigates risks and focuses on identifying and resolving problems before they become a problem. Whatever your security needs may be, think SecuriWORLD Canada for all your security guard Needs. You can request your Security Guards to be Suited or Undercover, however; Security Guards are generally Uniformed to represent their lawful authority to protect people, property, and assets. Security Guards are governed by Federal and Provincial regulations which set out the standards for eligibility in that jurisdiction including criminal record checks, and training requirements. The province of British Columbia has it’s own unique Security industry standard so it’s important to make sure that your Security Guards Company is legally authorized to operate in cities such as Vancouver, West Vancouver, Burnaby, Surrey, Coquitlam.